Click Here to Watch the Video Review! I’ve alway considered Yonex a racquet company, but that’s certainly not true anymore! This Japanese born company started in 1946 and its goal from the very beginning was to be at the forefront of athletic technology. Yonex is applying that theory across all its product lines, including the apparel and shoe divisions. So, I decided to try out my first ever pair of Yonex shoes. The Women`s Power Cushion Eclipsion Tennis Shoes are a new design for the company and I can tell you: the company is crushing its original goal. After so many months of being addicted to fluorescent flashy shoes, I was definitely ready to try something new. These classically athletic gray and white shoes don’t disappoint! Don’t get me wrong. These shoes still have flash. I love the understated orange color Yonex has chosen for this design, especially the gradient coloring through the side vents. 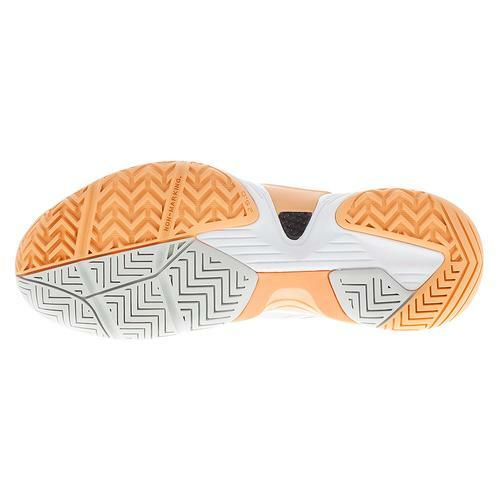 It gives the shoes an athletic look without throwing the brightness of the orange in your face. The first time I put these shoes on, I definitely felt a tightness that concerned me on the inside arch of my foot. I walked around that day at the office and still felt the tightness when I left for home that day. I put them back in the box and didn’t touch them for a couple of days. I was determined to play test them on the court before writing my review. Yonex designed this shoe with improved Power Cushion all along the midsole, and I wanted to test it out on the hardcourt. The 3 layer EVA material compresses when pressure’s applied and then rebounds back to its original shape. After playing in them a few times, I can tell you that these shoes did feel much more comfortable after being broken in. I didn’t feel the tightness in the arch area at all anymore and the shoe started to feel like a glove on the inside. The only area I felt a little crunch was the toe area on hard stops. It wasn’t severe enough to keep me from buying the shoes, but if you require a bigger than average toe box, this might not be the pair of shoes for you. The Eclipsions are perfect for ladies that like cushion, especially in the midsole and heel area, but still like a responsive, low profile shoe. 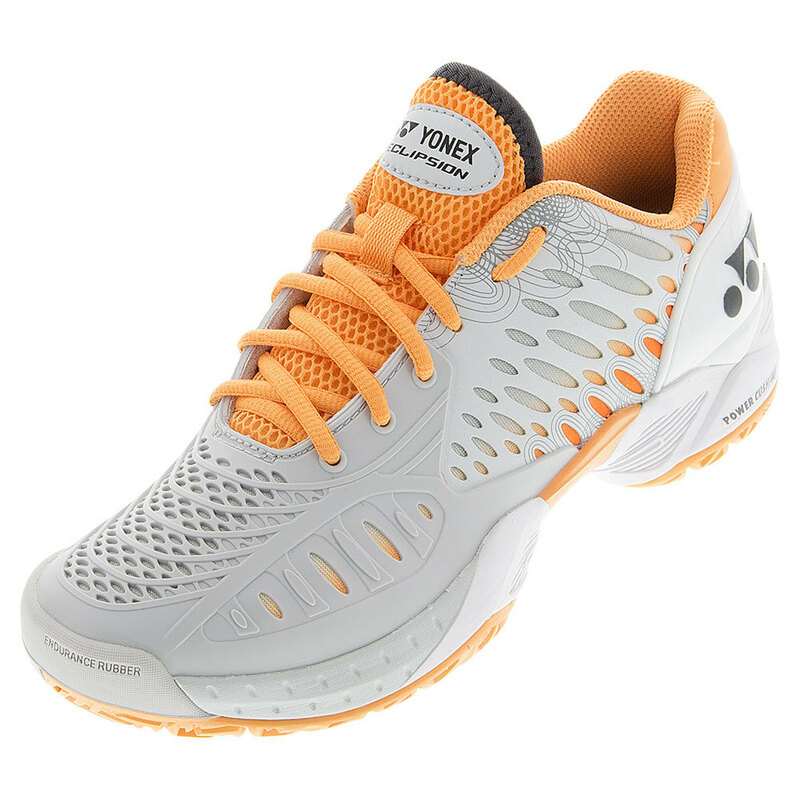 While the Eclipsions are not the lightest shoes you can buy, they do rank pretty high on the lightweight scale. If you’re used to running shoes, these shoes will be an easy transition to a court shoe. It won’t feel like a bulky oversized pair that you’re going to trip all over during court movements. Moving forwards for drop shots and backwards for the dreaded lob felt very natural. The outside of this shoe deserves some attention, too. Endurance rubber material surrounds the entire shoe. There’s extra material up front where you need it most and the sole is a modified herringbone to give you traction and flexibility. The breaks in the sole around the big toe and inside heel make sure you can move side to side easily to pick up those wide shots. If you’re looking for shoes that will help you stay quick on your feet, but still provide plenty of cushion, then the YONEX Women`s Power Cushion Eclipsion Tennis Shoes are the perfect choice for you! 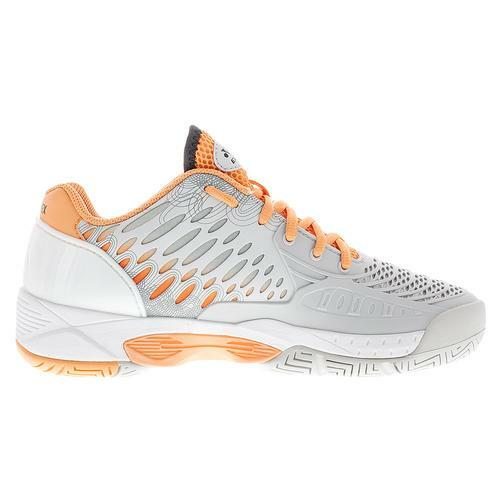 Get your pair at TennisExpress.com today!